Description: Crossing a near-frozen Mount Albert Creek. Description: CN 2602 & UP 7849 lead train UP MSKPB-13 thorugh Mt. Vernon, Illinois headed to Pine Bluff, Arkansas on the Pickneyville Sub. Description: Northbound Extra 301 crosses meandering Mount Albert Creek on a fine summer morning. CN Bala Subdivision, Pine Orchard. Description: The one and only J GP38-2 sits in Joliet yard. Description: Sitting outside the TRRA yard in Madison, Illinois near Quality Rail Services. 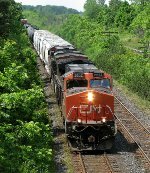 Description: CN 2602 leads a long, varied consist on a westbound train at milepost 215 in Little Falls. Description: Crossing the CSX/NS diamond at the west junction. Description: CN mixed freight passes the former Byrd Ave. grade crossing and parallels Harrison St. as it slows to halt along former SOO rails at Neenah, WI on 18 Oct. '15.